1 Where is La Rioja? The capital is Logroño which was also the name of the region until thirty or so years ago. 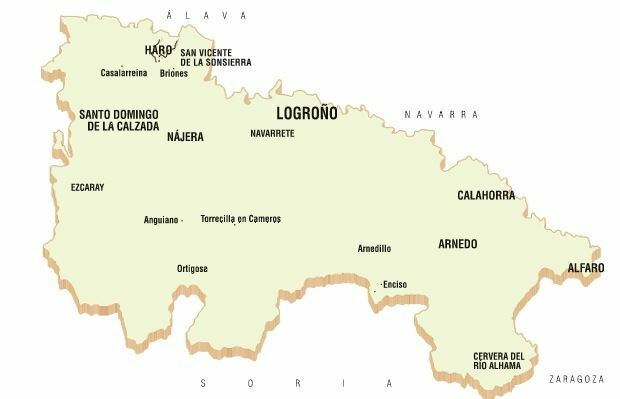 La Rioja borders the regions of Alava (read our detailed post including quick slideshow on this neighbouring winery heaven) in the Basque Country and Navarre, Aragon and Castille-Leon. The borders and its rulers have being a moving feast since time immemorial. The landscape is dominated by the River Ebro (and its seven valleys) which explains why agriculture is one of its most important industries – with the grape being its best-known and most important crop. Just like music, architecture and literature, it’s very hard to characterise wines and wineries. There are of course the modern and the traditional, and the family-run and larger companies. And there are the wineries that experiment with signature wines and invest in modern wineries – sometimes calling in big architectural names. But what do they all have in common? Location and grape would be the best answer. Riojan wines are usually made from the tempranillo grape. The location of the vineyard – whether in Rioja Alta or Rioja Baja – adds another dimension to the wines because the higher elevation gives rise to higher acidity and tannins. You should try one of each – and also add a Rioja Alavesa wine into the mix – and see whether you can determine the difference. Haro is in Rioja Alta and is home to prominent wineries such as Viña Tondonia, Muga, Cune, Roda and Bilbanas. Curiously there are many wineries situated close to the train station in Haro. The Rioja wine producers international profile benefited from Bordeaux’s vine diseases (mildew in 1852 and phylloxera in 1867) and the train station in Haro greatly facilitated trade between the two regions. To learn about the vinification and ageing processes used in La Rioja such as the size of the casks, and to find out which are the best vintages in Rioja’s wine history, you should read the Rioja’s DO guide. You’ll see that the ‘excellent’ rating was apportioned to five vintages already this century and nine in the previous one. You’ll also find some useful pairing guides to check which meals will best match which wines. Many US clients ask us about Parker points for individual wineries. Of course, every system (being undertaken by humans) is flawed in some way, but you can find the wineries and vintages that are scoring highly by the Wine Advocate here. 3 Which La Rioja Winery or Wineries to Visit? And Where? We recommend visiting no more than two wineries per day – one in the morning and one in the evening – any more than that and you’ll be rushing a visit to get to the next. If you are on a tight timetable, choose a base near Haro or Logroño and stick to wineries in that immediate area. Bear in mind that some of the smaller wineries may not give tours in English. The larger ones will but you will need to book a place. We at Totally Spain can help you with this. Roda in Haro is one of the big players but it only dates back to 1987. Grapes come from its 17 different vineyards to HQ in Haro for French oak ageing. Each is kept separate until the blending stage – one year after being barrelled. The exception is its Cirsion wine – a separate blend. You can visit the winery, visit a vineyard, have a wine in the wine bar and more. Did you know the Roda family also make olive oil in Girona? All available from the winery. CVNE in Haro is composed of three wineries: Cvne, Vina Real and Contino. It was founded in 1879 by brothers Raimundo and Eusebio Real de Asua and the company is still run by the same family. You can visit the winery and the Chillida sculpture exhibit is also great. The winery also runs workshops for children – which must be reserved in advance. If you are also travelling to Rioja Alavesa, you should consider a visit to the Contino winery (part of CVNE) – one of our favourite wines – which was established in 1973. 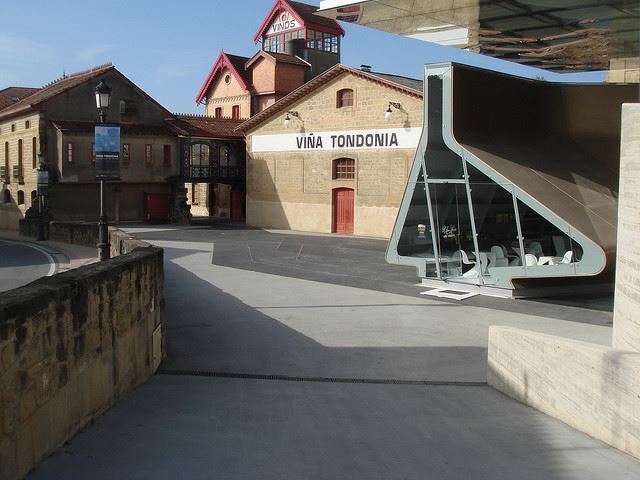 If you like architecture, you’ve may already know about the Zaha Hadid wine shop at Tondonia winery in Haro which centred on the recycling of a 1910 exhibition stand. But if you see its Txori Toki (the bird house) residence and tower you can see this is a family business with a history of great design. Rafael Lopez De Heredia y Landeta designed the tower so the name of the firm would be visible from a distance and also to offer a great vantage point to study the vineyards and the weather. The gallery or Swiss cottage from 1887 is another beautiful space – initially a residence, it will be used as a reception area. The winery visits offers a great insight on the wine-making business and the role of the winery in the community. Historians will really enjoy this winery. And we haven’t said anything about the wine yet! If you are interested in the history of wine-making, you should visit Vivanco in Briones (just 9km from Haro) where you’ll find a truly astonishing award winning museum of wine culture (including a Picasso or two) as well as a winery. 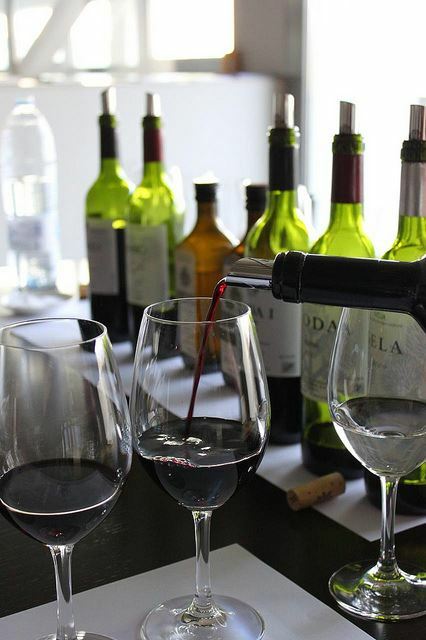 You’ll also find a gastrobar, restaurant and wine-tasting courses offered. You should try to visit one of the smaller wineries in the area. One of the local heroes is Finca Allende’s Miguel Angel de Gregorio. Together with his sister Mercedes, Miguel first produced wine back in 1986 but the winery dates from 1995. Miguel is considered to apply a modern approach to its wine-making and is one of the most respected figures in the industry. To see the winery you’ll have to email well in advance to request a visit as this is one of the smaller wineries and doesn’t have dedicated staff for tours. Totally Spain can assist you with this. If you can see the place and meet the man – you’ll remember it. And if you are in the area in June, and enjoy re-enactments, don’t miss the medieval festival held in Briones on the second weekend of June. 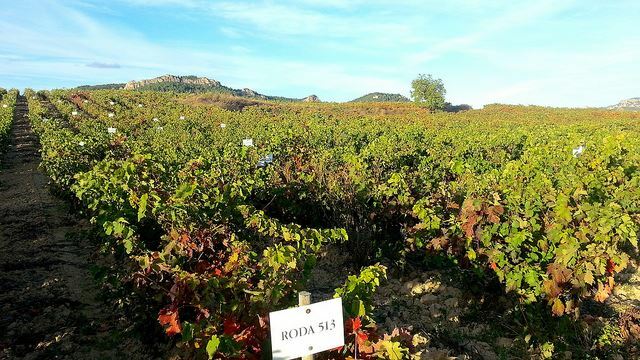 5 Rioja Baja – Great Wines and Wineries Too! Of course, there are hundreds of great wineries in the lower part of Rioja also. We can outline a detailed itinerary for you including visits to Bodegas Ontañón for its art and wine combination, Campo Viejo for sheer scale and modernity and Marques de Murrieta for a mix of the old with the new – all near Logroño – if you prefer to be in the south of La Rioja. 6 Monasteries, Hot Springs and Dinosaur Trails in La Rioja Too! There’s a lot more to see in the Rioja area than wineries. 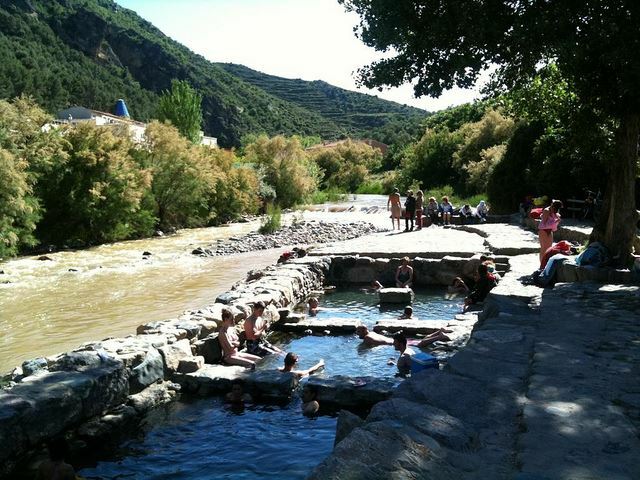 How about visiting a monastery in the morning or walking a dinosaur trail and relaxing in a hot Spring as the sun sets? 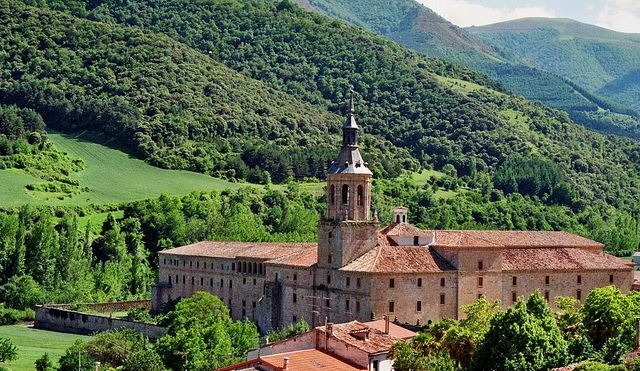 The Suso and Yuso monasteries in San Millan de la Cogolla were declared a world heritage site in 1997. Suso is the older of the two monasteries built by the 6th century Saint Millan. He is credited with the first literature produced in Castilian. In 1053, his remains were transferred downhill to the monastery in nearby Yuso. A further church was added in the 16th century. It’s an interesting visit for anybody interested in architecture, history and the Spanish language – just 35km from Haro and 43km from Logrono. 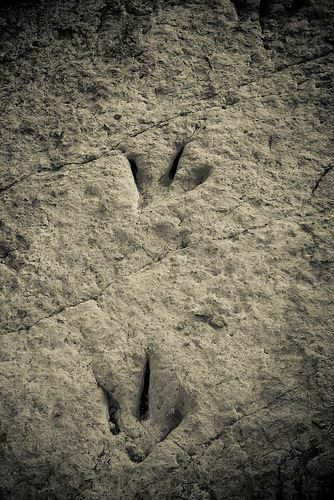 If you are travelling with children, you should not miss the dinosaur trails in La Rioja. You can see the footprints left in what was a sandy and marshy area. There are many sites to see but Arnedo and Enciso are probably the best known. The paleontological museum in Enciso and the activity park nearby is a great way for the kids to unwind and explore while having fun. The latter is a handy treat if you have been taking them on a number of the more formal winery visits. You might like to check out this video of the Barranco Perdido Activity Park. Enciso is 49km from Logrono and 93km from Haro. It is very warm in La Rioja in the Summer (in fact we have a blogpost about just that here) but it’s the only time you’ll get to see the wine battles in Haro and San Asencio and the wineries are a great place to escape from the heat of the midday sun as the temperature is always cool inside the bodegas. Just be careful how must wine-tasting you do in the heat!! If you are travelling in September – at harvest time – you might find it harder to visit the smaller vineyards and wineries but you will get to see harvest festivals such as the large one in Logrono held at the end of September. Even in Winter – it’s a great place to visit. The climate is quite dry so although it may be cold – you will still get some great sunlight. We have worked with a number of excellent providers in the area for 14 years. We always recommend the paradores. You’ll find two paradors in Santo Domingo (20km from Haro and 46 from Logroño) and another in Calahorra (55km from Logroño and 92km from Haro). The older of the two paradors in Santo Domingo is a former 12th century hospital. The town itself is close to many wineries and is located on the Camino de Santiago so you’ll see lots of scallop-wearing walkers passing through the area. The parador at Calahorra is a modern building and is very handy for the dinosaur trails. We also recommend staying in Arnedillo which is lovely. You can contact us to learn of the various options we have in La Rioja. 9 What to Eat in La Rioja? The question should be what not to eat. This is a wonderful area for great ingredients and you will find them prepared excellently. You should make sure to try the ‘patatas a la riojana’ stew made with potatoes, chorizo and red pepper. 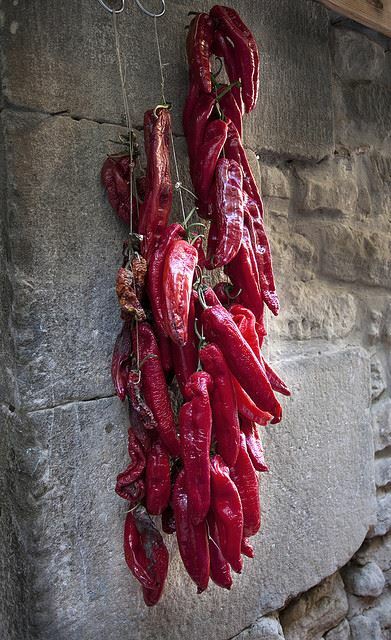 Rioja’s peppers are pretty delicious. Also try to sample the white asparagus and the fish dishes such as salt cod (bacalao) and hake (merluza) cooked ‘a la riojana’. The region is well known for its lamb (cordero) and – not surprising for a region that’s good with slow-cooked dishes – if you see oxtail (rabo de buey/toro), make sure to try it – you will not regret it. The timetables in La Rioja will be quite traditionally Spanish (see our guide on when to eat in Spain here). Tapas are a handy filler during the day and a great evening meal on the hoof. It’s also the perfect way to sample some lovely wines by the glass as well. Enjoy some bar hopping in Logroño on Calle Laurel and pop over to Calle San Juan as well. For tapas in Haro, head for the Herradura area. Haro in the north of La Rioja is one hour’s drive from Bilbao and 40 mins from Vitoria. Logroño is half an hour SE of Haro. Laguardia (Rioja Alavesa) is half an hour east of Haro (see our post on this below). Your best option for touring La Rioja is to hire a car or arrange a driver to take you around. 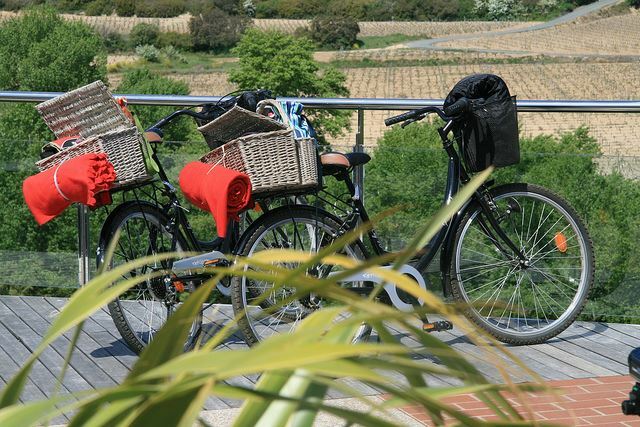 You will see some walkers and cyclists too – although some of these are on the Camino de Santiago. 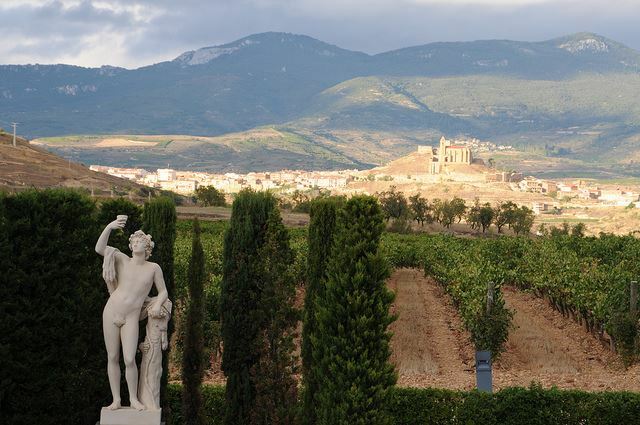 11 Who Will Enjoy a Trip to La Rioja? The most obvious are wine-aficionados. But also photographers and those who appreciate beautiful scenery and historical towns. It’s also a great family trip. And you might be surprised to know that it’s a popular destination for groups of friends as well. Foodies will also enjoy the cuisine. La Rioja would also make a lovely romantic get-away and an interesting honeymoon destination for a couple who enjoy special meals and wine-tastings. It’s also a wonderful place for a weekend break. See which airline flies you into Bilbao Airport and plan your getaway! Gran-reserva – 5 years ageing, 18 months in oak and 3 years in the bottle. A que sabe? – what does it taste of? If you like to learn about the people behind the wineries, we recommend John Radford’s The Wines of Rioja from 2004. There is a kindle version for sale as well as the printed book. Why a book from a decade ago? You only have to read a few lines to get a sense of the fun and love he had for this region and his ability to capture the characters behind the wineries makes it worthwhile. The writer passed away in 2012 giving these pages on Rioja even more importance than ever before. 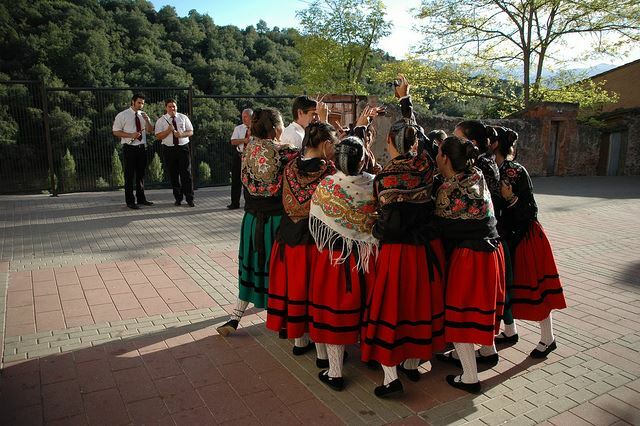 14 And how about a trip over to La Rioja Alavesa? Want more? You’ll enjoy our two posts from La Rioja-Alavesa: A Parador Break – Vitoria & the Rioja-Alavesa & Rioja Alavesa Wineries and Laguardia Walled Town. If you are curious about visiting other wine regions in Spain, we’ve also written about Spain’s best wineries to visit and produced guides for the Rias Baixas, Ribera del Duero, Jerez and Cantabria. Posted in Accommodation, Active breaks, Bilbao, Camino de Santiago, Festivals, Food & Drink, Insider Spain Guides, La Rioja, Museums & Galleries, Paradores, Popular Posts, Wineries and tagged Arnedillo, Barranco Perdido, Bilbainas, Bodegas Ontanon, Calle Laurel, Campo Viejo, Chillida, CVNE, dinosaur trails, festivals, fiestas, Finca Allende, Haro, Logrono, Marques de Murrieta, Muga, Parker, patatas a la riojana, phylloxera, Rioja Alta, Rioja Baja, Roda, San Millan de Cogolla, Spain, Suso Monastery, tempranillo, Txori Toki, Vina Tondonia, Vivanco, wineries, winery tourism, Yuso Monastery, Zaha Hadid.